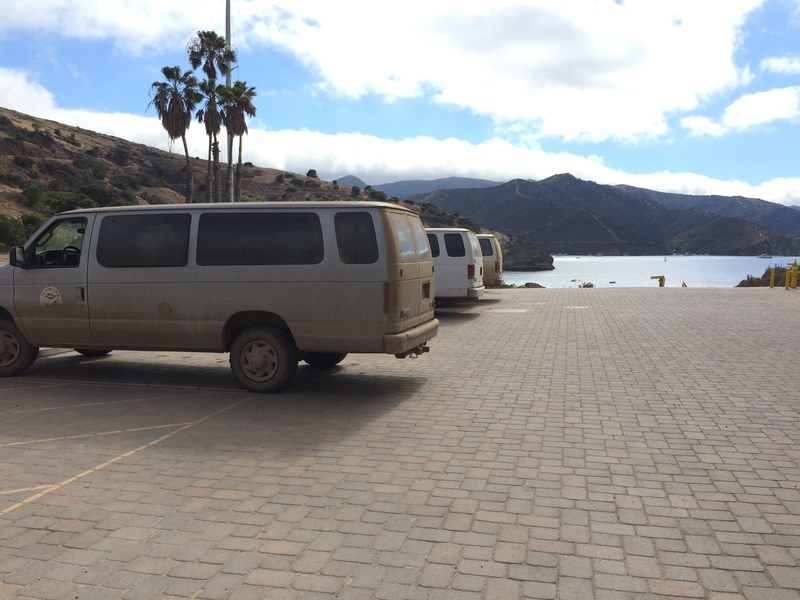 Driving down one of Catalina’s dirt roads can be a very dusty endeavor, but they are one of my favorite venues for scientific discussions. Often, I find myself in company of enthusiastic researchers while driving to various collection sites on the island, and good conversation inevitably ensues. This last week, for example, I had planned to take an undergraduate colleague James Duffy, a young scholar working with me in the Research Experience for Undergraduate (REU) program, on a collection trip to Shark Harbor for some California mussels (Mytilus californianus). Before the trip began I was contacted via email by a graduate student from UC Davis, Micah Freedman, who would be on island to look at the Catalina Island Conservancy’s deer exclosure sites: could he tag along on our trip? Of course I obliged, and we set off. What followed was a few hours of discussion between us three regarding our various research topics and interests. Conversation meandered between the genetics of orchid bees, to the evolution of plant volatiles, to plant responses to herbivore predation, to aquaculture production bottlenecks, to west coast bird populations, to chemical cues of predation in fish, to name a few. Wrigley vans: a science lover’s ideal conversation site. But these kinds of interactions aren’t simple waxings of topics philosophical, a nice meta-benefit of life on the island; they often have tangible outcomes. Through our interactions, I was able to understand what kinks needed to be ironed out for my new graduate student colleague’s research, and I happened to know a few people that could help him solve said problems. Introductions were made, and my new friend has an easier path toward reaching his scientific goals. What I gained from our interaction is a new connection with a terrestrial lab doing cool science at a university that I knew only by name just hours before. And this is the spirit of the Wrigley Institute for Environmental Science: great minds (if I can take such a liberty) convening to the betterment of the scientific community. Consider that this is just one example of a single interaction! I see and experience these types of bonds being made on a daily basis at WIES. I study aquaculture, the genetics of bivalves, and how we can produce more sustainable protein from California’s coastal waters. Among other projects, I am working this summer to develop a protocol with REU student James to create the first cryopreserved eggs for the extremely economically important blue mussel. And though my studies are mostly marine based, they are supported from a network of scientists and thinkers that span many academic disciplines. I had the chance to expand my support network this past week, and you never know where that may lead. These kinds of opportunities are one reason why I look forward to continuing my work at WIES. 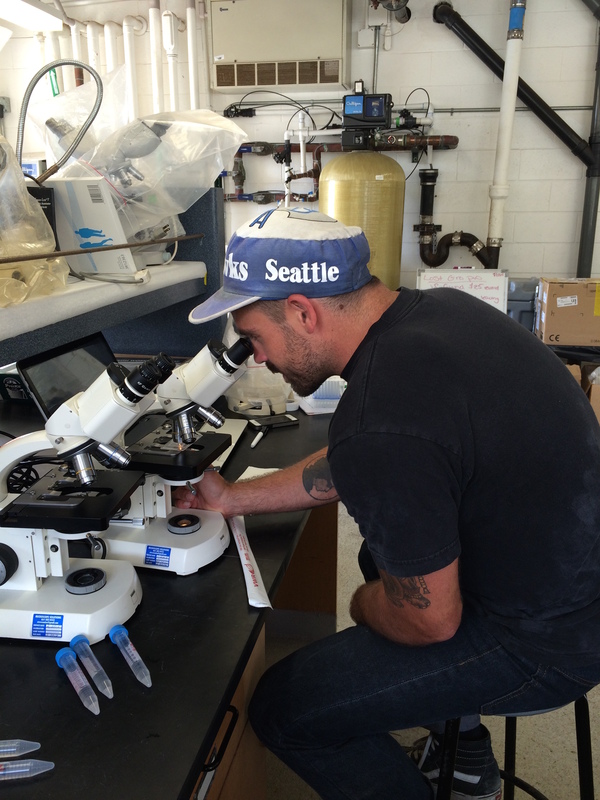 Nathan is a graduate student in the research group of Professor Sergey Nuzhdin, studying the genetic traits that contribute to successful sustainable bivalve aquaculture. He is a member of the USC Department of Biological Sciences Program in Molecular and Computational Biology. This entry was posted in Graduate, Wrigley Institute on July 23, 2015 by Jessica Dutton. After much anticipation and excitement in the months leading up to my Wrigley Institute REU (Research Experiences for Undergraduates) program, (and plenty of repacking and packing to make sure I had everything I could possibly need but still fit the airline standards), the morning of my flight came. I was nervous and excited, with no idea what USC had in store for me aside from lots of hard work. In the weeks leading up to first week, I had spoken with my mentor Dr. Doug Capone, and graduate student, Michael Morando, to go over my project – N2 fixation associated with the invasive Sargassum horneri, make plans for my time at WIES, and with some literature to read to catch up on my topic. As I boarded my plane on June 14th, my emotions were everywhere from excited to nervous and everything in between, especially since it would be my first time on the West Coast after living in the northeast my entire life. I spent the six hour flight wondering what to expect and imagining how the summer would pan out. Upon landing and arriving at USC, I was in love with the beautiful campus that was huge in comparison to my small university. I got settled in my room as the rest of the REU interns started arriving. I was impressed by their backgrounds and the range of topics they’d be studying this summer, from a great hunt for tardigrades to photochemistry of iron. The next morning we jumped into the program as we began the REU orientation, led by coordinators Diane Kim and Karla Heidelberg. They briefed us on the program and Institute, and as a group we went over some tactics on meeting with our mentors and how to tackle the obstacles that we might face this summer. Following lunch they let us loose, where everyone went for a tour of the campus while I went to meet with my mentor for the first time, a bit anxious but feeling more prepared after going through the orientation. We went over my project in further detail and scheduled another meeting and some lab time for the next day. The next day, three students left for Catalina Island where they’d meet with their mentors and spend the week SCUBA diving, while the rest of us dove into a week of meetings, lab training, learning techniques, and spending hours scouring through manuscripts on our topics. We started getting into the crucial details and ins and outs of our projects, developing a plan for the next seven weeks of our summer research. 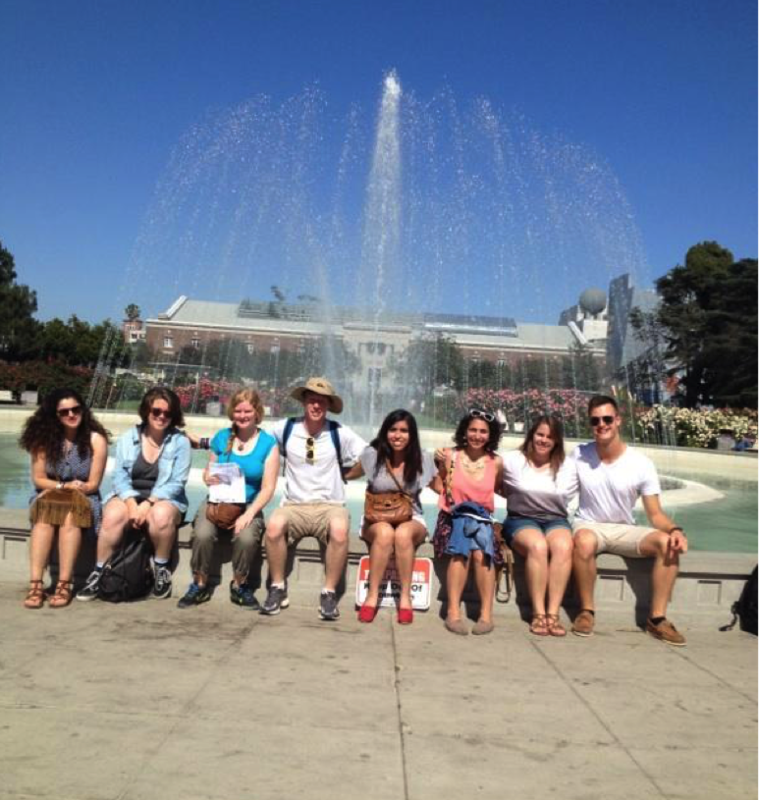 However, the week wasn’t just spent in the lab or at a desk. On Wednesday we had the great opportunity of going on the R/V Yellowfin for a SPOT research cruise. We learned about SPOT, which is the Sand Pedro Ocean Time-series, which sails out once a month with a conductivity, temperature, and depth (CTD) meter to measure these parameters in the nearby ocean. We got to observe and even assist in the sample collections and processing, while learning about different oceanographic equipment and techniques. We even somehow found time to enjoy our time exploring LA, which was especially exciting for the out-of-staters like me. We tried out a variety of cuisines, from traditional Mexican, to Thai and even some delicious Ethiopian food at El Mercado. We made a trip to Downtown LA where we caught a movie, explored the Natural History Museum, took a trip to Santa Monica for a beach day, and one of us even found the time to walk over to Hollywood. All in all it was a whirlwind of a week, filled with lots of learning, delicious food, and new experiences that brought us close as an REU cohort. 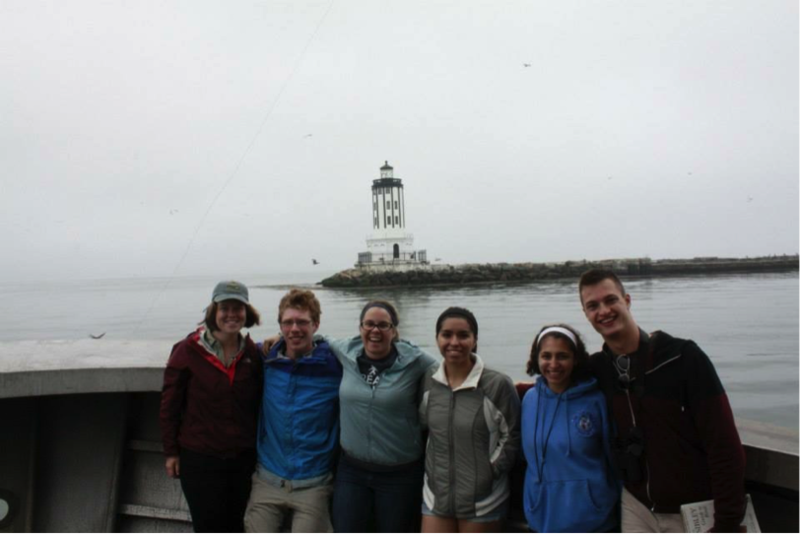 We all learned a lot during the first week, and we embarked on the Miss Christi boat, equipped with not only our luggage, but tons of new skills that we’ll put to use during our summer of intense and exciting research on the beautiful Catalina Island. Amanda comes to the WIES REU program from the University of New Haven, Class of 2016. Her major is Marine Biology and Biology, with a Chemistry minor. 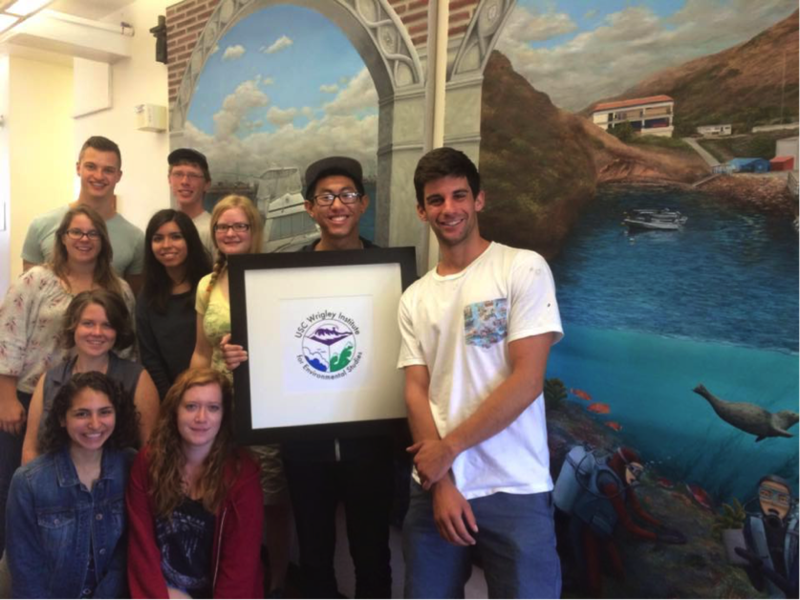 This entry was posted in Undergraduate, Wrigley Institute on July 7, 2015 by Jessica Dutton.